The statue of Samuel Adams in downtown Boston. 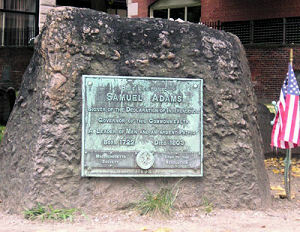 Samuel Adams (1722-1803) a life-long resident of Boston, was considered by many to be the "father of the American Revolution." 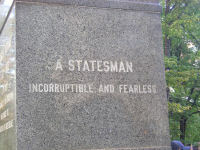 He helped develop the philosophical concept of the necessity of legal non-violent citizen resistance in a free society. He understood that when governments become corrupt and tyrannical, compromise of principles only leads to greater corruption and tyranny. He was the first to conceptualize a political break with Great Britain, and when others (including his cousin John Adams) favored negotiation with the British his strength of will not to give in eventually brought the major figures together to make the American Revolution a reality. He was the most influencial political writer of the day, but also was a brilliant strategist whose pioneering tactics of civil disobedience stifled the British and paved the way for the military campaign that ensued. Like Jefferson, he understood that human nature requires that a free people must maintain a constant vigilance -- indeed, a perpetual civil resistance movement -- to keep governments from falling into despotism. 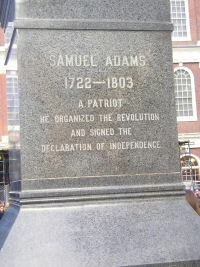 After the Revolution, Samuel Adams became Governor of Massachusetts.